“Vehinei Hashem nitzav alav…” The chassidic choir sings the Zutchke niggun that has become a Chassidic hit, “Umelo kol ha’aretz kevodo.” The song was composed by Harav Asher Yeshayah Rosenbaum, the oldest son of the Zutchke Rebbe, zy”a, and himself a venerated mashpia. The Chassidim who came from America to spend Shabbos in Meron, together with the Rebbe’s son-in-law Harav Tzvi Elimelech Biderman of Lelov, were enveloped with dveikus during the peak hours of Shabbos, not knowing that they would have to forego the traditional bonfire with Reb Meilech in the courtyard of Rabi Shimon Bar Yochai’s tziyun that evening. 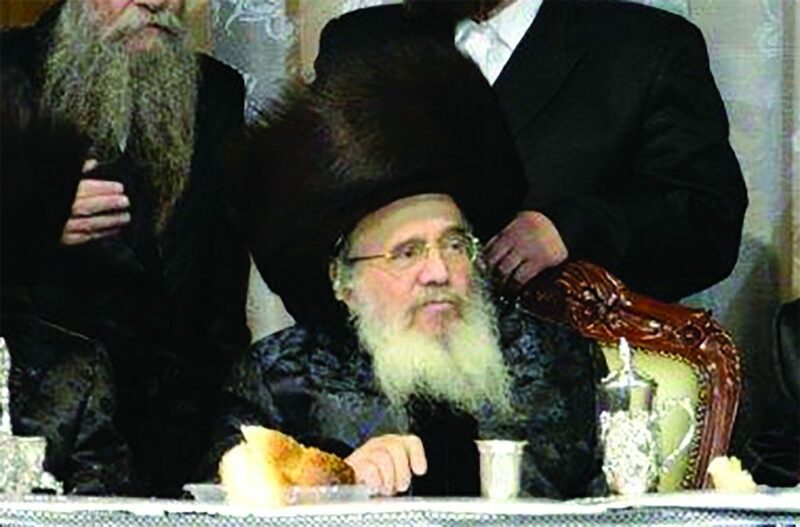 On Motzoei Shabbos, the bitter news came through: The Zutchke Rebbe had passed away. The Rebbe, Harav Nosson Dovid Rosenbaum, zy”a, was known as a master educator and pedagogue, who taught and inculcated thousands of talmidim in New York and in Bnei Brak, and most notably became known as the “Tehillim Yid” who davened for anyone who came to his home seeking a brachah. He would not only bless the person, but he would immediately begin reciting Tehillim for the brachah to be fulfilled. But it is impossible to stop Reb Meilech during the lofty, glorious moments of shalosh seudos in Meron, with hundreds of guests from abroad. They sang and cried, and Reb Meilech cried with them. Among other things, he spoke about his father-in-law, the Zutchke Rebbe. During his childhood in Drohoy, Romania, at the Seder, when they reached Shefoch Chamascha, the child asked his father who the Jew was who had just entered the house. But the venerated father hushed him and taught him that not everything that one saw did one need to speak about. Indeed, it was said that from then until his final day, the son practiced this lesson, and would not speak about everything he saw and knew. Rav Nosson Dovid had leagues of talmidim who cleaved to him and followed his every word, but he asked for no honor or glory. He kept to the sidelines, and always referred to himself as the son of the Zutchke Rebbe, even though his father passed away nearly 20 years ago. In Boro Park, his acquaintances remember him as someone who never raised his eyes from the ground, and who would walk around with his Sefer Tehillim at all times. It is told that while he was learning in Yeshivas Shaarei Yosher, the bachur Nosson Dovid went to his room to light the Chanukah candles. As was his way, he became totally caught up in the holiness, and did not notice that the fire began to spread around the room. Other talmidim who smelled the smoke hurried to extinguish the flames, and only then did Nosson Dovid realize for the first time the storm his little lechtel had caused. One of the roshei yeshivah remarked at the time: He’ll yet become a great Rebbe. The Jewish world mourns the loss of the pillar of tefillah, who cast the mantle of his tefillos, his pleasant tunes and his nobility on all those around him.